Simplify date and time processing in your PHP scripts. Someone once famously said, "the more things change, the more they remain the same". And nowhere is this more true than in the area of programming languages. No matter what your poison may be - Perl, PHP, Python, JSP - every language comes with certain fundamental constructs and concepts that are widely-understood and used. For example, though they may be called by different names, almost every language comes with string, numeric and array variables, conditional tests, loops, functions, exception handlers et al. This commonality makes it possible for experienced developers to easily switch from one development environment to another. This switch is not necessarily instant - the devil is still in the details - but a sound understanding of basic programming principles can go a long way to make it more painless. What does this have to do with anything? Well, almost every language - including PHP, which is the subject of this article - comes with certain basic capabilities for date and time value manipulation. These capabilities may be implemented as functions, objects or object methods, but they do exist, in more or less similar form, in almost every language. And, over the course of this article, I'll be looking at how they work, and how they can be used to add something new to your bag of PHP tricks. First up, before we get into anything too complicated, let's take a quick tour of the important date and time manipulation functions that come with PHP. The simplest and most basic thing you'll want to do with PHP's date API is, obviously, get the current date and time. This is best accomplished via the getdate() function, which returns an associative array containing date and time information. // this would generate output of the form "It is now 9:14:34 on 23.5.2001"
How did I create the timestamp? Flip the page to find out. Most of PHP's date functions work on the basis of timestamps. This timestamp is a unique numeric representation of a particular date, calculated as the number of seconds between January 1 1970 and the date and time specified, and makes it easier to perform arbitrary calculations on date and time values. This integer can now be passed to getdate() - or any other date function that accepts timestamps - and converted into a human-readable representation. Notice also that the "0" key of the array returned by getdate() contains a UNIX timestamp representation of the date returned. If you don't like mktime(), you can also use the time() function, which returns the current timestamp (note that you cannot use this function to generate arbitrary timestamps, as is possible with mktime()). If you need greater accuracy in your timestamp, take a look at the microtime() function, which returns a timestamp in seconds, together with an additional microsecond component. These two values can be added together to obtain a more precise timestamp value. Like time(), this function too cannot be used with arbitrary dates and times - it only returns a timestamp for the current instant. Once you've got yourself a timestamp, you can use the date() function to format it and make it look pretty. This date() function is easily one of the most useful functions in this collection - it allows you to massage that long, ugly timestamp into something that's a pleasure to read. This is just a brief list, take a look at the PHP manual for a complete list. // example: returns "12:28 pm 20 Feb 2002"
// example: returns "12:28 20 February 2002"
// the output would be "01 Feb 2001"
// would generate "028 2345 2o3 12:23 20 Feb 2002"
// would generate "It is now 12:23 20 Feb 2002"
// returns "20 Feb 2002"
// returns "21 Feb 2002"
// returns "27 Feb 2002"
// returns "05:00 14 Feb 2002"
It's unlikely that you'll ever use these, since most of what they provide is already available via the functions discussed previously. However, they're included here in case you ever have a need for this specialized information. This function comes in particularly handy if you need to validate date information entered into an online form - simply run the datestamp via checkdate() to see whether or not it's valid. The first thing to do is set a few class variables to hold the month and year to be displayed - these variables will be used throughout the class, and are crucial to it functioning correctly. The values of the current year and month are set in the constructor, and are obtained via user input when an instance of the class is created. The date() function even lets you find out if the year under consideration is a leap year - if it is, it's necessary to modify the $totalDays array for the month of February. Since the date() function only works on a correctly-formatted UNIX timestamp, the mktime() function is used to first convert the numeric month and year into an acceptable format. 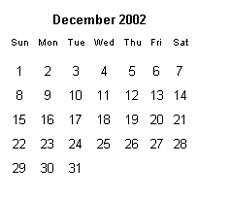 Now, let's get into the display() method, which takes care of actually printing the calendar. There's one important thing needed here: the day of the week on which the first of the month falls. The first day of the month (from the $firstDayOfMonth variable) and the last day (from the $totalDays array) provide the bounding values for the month view I'm going to be building. I'll explain how this view is constructed row by row. The first row contains just the name of the current month. The next row contains seven cells, one for each day of the week - I've used the substr() function to display the first three letters of each day name from the $days array. The next few rows are all generated automatically. The first order of business is to place the first day of the month on the corresponding day. Since I already have a $firstDayOfMonth variable, I've used a simple loop to fill all the cells prior to that day with non-breaking spaces. The $rowCount variable is simultaneously keeping track of the number of slots (cells) being filled up - I'll use this a little further down to determine when the end of the week has been reached. Once the first day of the month is determined, another "for" loop (iterating from 1 to the number of days in the month) is used to generate the remaining rows and cells of the table. The $rowCount and $dayCount variables are incremented at each stage, and the $rowCount variable is divided by 7 to find out when the seven slots available in each row are filled up. Notice that I've inserted an "if" statement into the loop to display the current date in a different colour, if a match is found. This is just one example of the myriad uses to which PHP's date functions can be put. There are many more; I'll leave them to your imagination. Until next time...be good! Note: All examples in this article have been tested on Linux/i586 with Apache 1.3.20 and PHP 5.1. Examples are illustrative only, and are not meant for a production environment. Melonfire provides no warranties or support for the source code described in this article. YMMV!